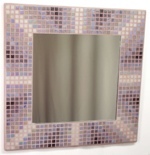 Home Studio crafted, fully tiled and grouted with small vitreous glass mosaic tiles, a choice of grout colours and a choice of Satin or Aluminium edging, this mosaic mirror will brighten up your walls, or with the optional stand can decorate your dressing table or other surfaces. 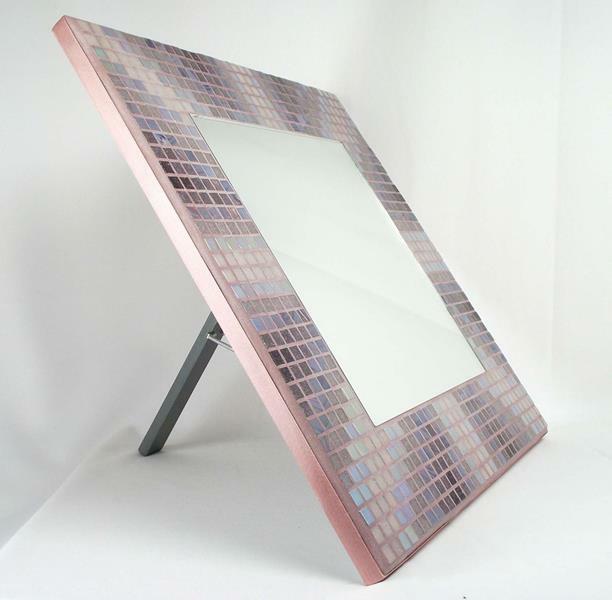 It is made from 672 tiles in 6 colours, with a nominal size of 38cm wide x 38cm high (approx 15 x 15 inches) and a 24cm x 24cm mirror. 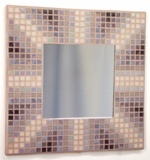 This photo shows the Moorland Unity 38cm Mosaic Mirror, in the Satin Edged format for wall hanging. 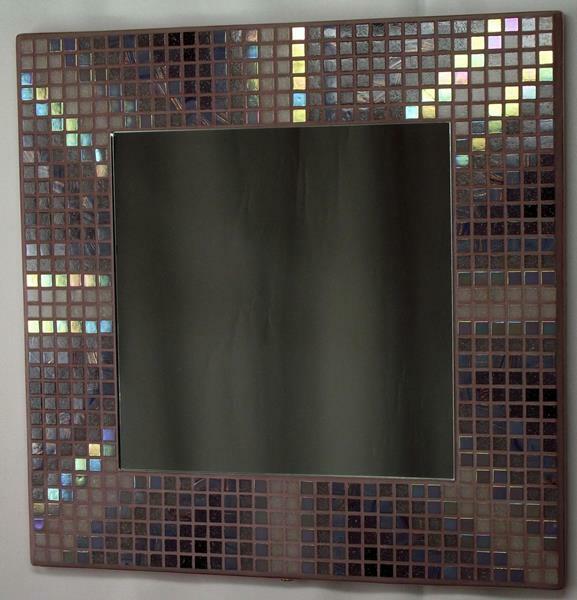 This photo of the Moorland Unity 38cm Mosaic Mirror shows some of the Iridescent tiles coming to life with coloured shine. 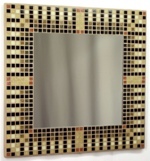 This photo shows the Moorland Unity 38cm Mosaic Mirror, in the Satin Edged format complete with Stand. 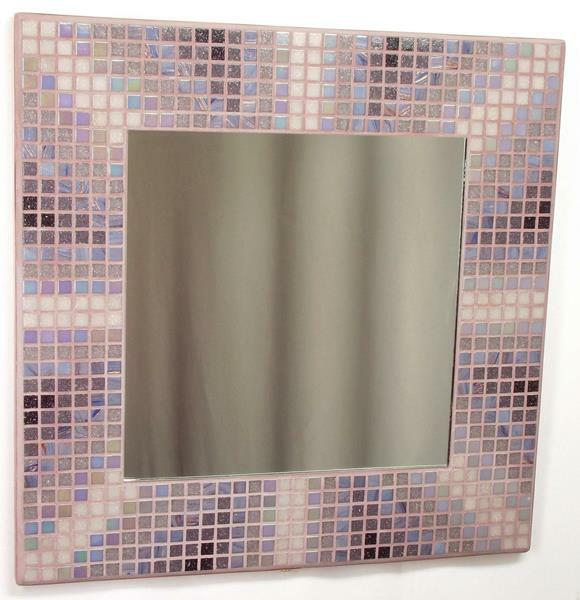 A range of pinks and lilacs, reminiscent of flowering heather on the moors, including an iridescent lilac and a marbled lilac with blue and metallic gold highlights, with a lilac grout. Satin Edge colour: Mauve. 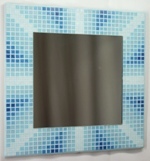 Our contemporary take on the Union Jack, with graduated and unified colours. 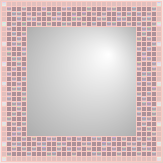 These special tiles add shine and bling to the design - the base colour tile has a reflective, multi-colour, pearl-like sheen to it, similar to an oil film on water or a soap bubble. The effect varies from different viewing and lighting angles, and from tile to tile, so as you move around the room the design can come to life with a coloured shine. 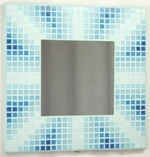 Subtle variations in tile base colour can be seen between tiles, especially on the lighter colours, as can the degree and colour shade of the reflective sheen, so each mosaic is unique and your mosaic may not be an exact match for image shown. Available soon: please ask for a quote.